Are you an iPhone 8 or iPhone X user and you wish to download videos on your phone? Day by day a lot of videos are being released or being curated which are entertaining that you may wish to download on your phone. After downloading the videos, you can easily share them on social platforms to friends and followers. With this urge to download videos online to iPhone 8 or iPhone X, a free video downloader for iPhone 8 and iPhone X comes in handy, which you will be introduced to in this article. Snaptube Online Downloader has been well designed to support several websites like Facebook, Instagram, Vevo, Vine, Liveleak, FunnyOrDie, Vimeo and much more. From the online downloader, you just have to copy and paste the link on the search button and allow Snaptube to search the videos. Moreover, you can also enter the keywords and search on the specific sharing site that you want to download videos. SnapTube Online Downloader has a great user experience and it is absolutely free to download videos and audios from the supported sites. Furthermore, the download speed from this online downloader is super fast compared to other online downloaders. In the next part below we will show you how to download videos on computer and transfer them to your iPhone 8 or iPhone X. The steps below show you how to download videos in iPhone 8 or iPhone X. You can type the keywords of the video that you want to download and they will appear below the search box. Alternatively, you can click on the search box and paste the link of the video from sharing sites to the search box. Next, you can click the Download button on the selected displayed search results. 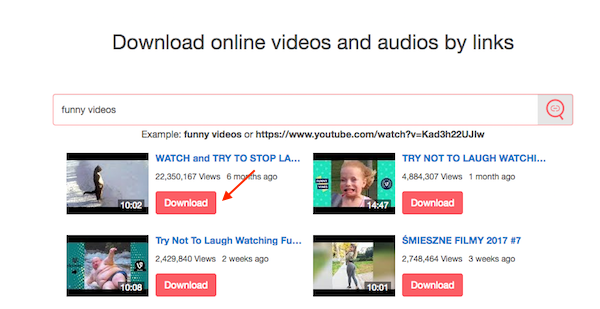 Snaptube Online Downloader will load and let you select quality of the download video. Click on the “Video” button and then choose the file quality whether 360p, 240p, or 144p with a corresponding file size. After that the video will again load on a new tab and it play before you can download to your computer. Wait for the video to be fully downloaded before transferring to your iPhone. Open iTunes on your computer. Take your iPhone 8 and connect it to your computer using a USB cable and iTunes will automatically detect it. Click on your iPhone 8 on iTunes window. From there click on “Movies” and then go to downloaded videos folder and drag the video to movies folder. iPhone are sleek phones with amazing features. Even though you may have used your used iPhone for long you may not have used all features. Here are some of tips and tricks when using iPhone. Always backup your videos, music and audios to iCloud or iTunes. To be able to transfer multiple files easily from your computer to iPhone, you need to install third party iOS data transfers. You should always master how to hard reset your iPhone just incase it stops suddenly from working. To hard reset you just have to click on Power button and Volume Down button simultaneously for a few seconds. iPhone allows you to change resolution of your videos. Go to Settings > Photos & Camera and then click on “Record Videos Option”. From there, you can set you’re your video recording to high or low resolution. With the Music app on iOS 10 you can queue next song with “Up Next” feature.